After 3.5 weeks of counting it is time for a little update on how things are going in the first ever official spring count in Batumi. Black Kites in front of the Batumi skyline. Photo by Diego Jansen. Where to start? Well, let's start with the beginning of the day: unlike in autumn, where you are woken up by just the sound of the local rooster calling, in spring he's joined by a choir of feathered friends. Next to our lovely guesthouse a male Common Redstart (samamisicus, the Caucasian subspecies) has his territory, which he shares with a Semicollared Flycatcher, both nice birds to see before you’ve even had your breakfast. After a good Georgian breakfast we head up to our spring station, which is situated just behind Station 1, our main counting station during the autumn. From there we have a good view of the incoming birds from the south. Photo compilation of a Black Kite catching small insects while mid-air and on migration. Photo by Diego Jansen. During the first few weeks the day usually started with a decent stream of Black Kites flying over the sea! Quite a surprising route, as you would expect them to avoid flying over this type of surface due to the lack of thermals. From the data of GPS-tagged kites and from our own observations we have seen that they often fly over the Batumi bay; instead of following the coastline they simply take the shortest route north, which happens to go over the sea for quite a while. Flying over the sea comes with a benefit though, as kites are known to be great at catching fish. We have actually observed them catching fish while migrating. Eat your heart out Osprey! But the hunting doesn't stop at the water's edge. On multiple days we have observed Black Kites catching small insects while they were flying over the station, actively changing direction and swooping in order to catch the bugs. Amazing behaviour, not observed during the autumn count, probably due to lack of available prey, or perhaps because the southbound route provides them with other available food sources? Who knows. Apart from this very interesting migration strategy the numbers are also mind-blowing. With a peak day of 41.000+ black kites, we have beaten our autumn record not only for the peak day but also for the season total number: as of the 14th of April we have counted over 190.000 Black Kites, and more are yet to come. The 200K mark is within hands’ reach! Sometimes you don’t need to go to the botanical garden to see one: photo compilation of a Krüper’s Nuthatch visiting the Sakhalvasho station. Photo by Diego Jansen. It goes without saying that the Black Kites are not the only raptors migrating. They are accompanied by the usual suspects: Steppe Buzzards, Marsh Harriers, and Lesser Spotted Eagles. However, two relatively rare partners have joined the journey as well: from the station we saw a Golden Eagle and a Cinereous Vulture moving north together with the kites and buzzards. On another afternoon, two young Imperial Eagles decided to put on a show, with one trying to steal prey from the other, occasionally interlocking their talons and spiralling down towards the ground. Never a dull moment in Batumi. And when the raptors are not present, we are kept company by a Sardinian Warbler, only the third record in Georgia. Perhaps the species is much overlooked in autumn but easy to find in spring? Other passerines have also come to greet us on the station: we had a visit from a Red-breasted Flycatcher, Ortolan Buntings, and a Krüper’s Nuthatch, the latter being a much sought-after species here in Batumi. 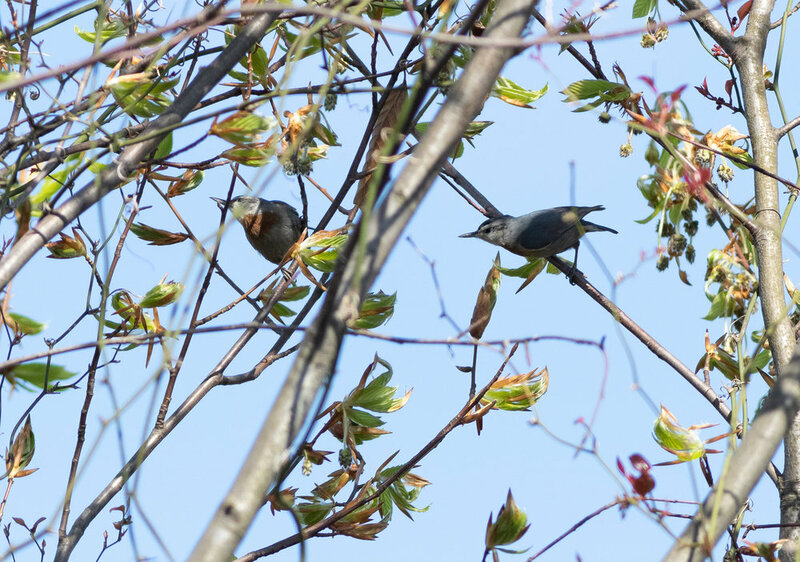 The air around us is also filled with passerines and other small migrating birds. Imagine the summer sound of screaming swifts while counting a stream of Black Kites. Spring is the time of the year! Short-toed Eagle passing by closely. Photo by Diego Jansen. Light-morph Booted Eagle. Photo by Diego Jansen. In autumn adult Black Storks don’t look this neat anymore. Photo by Diego Jansen. As for the other monitored species, the numbers are trailing a little behind the numbers we count during the autumn count still. Some might take a different route when flying towards their breeding grounds, while others have yet to arrive. The most anticipated of them is of course the main star of the the Batumi show: the Honey Buzzard. In autumn we count roughly 500.000 of them, but in spring we expect they may show up in even bigger numbers. Some counters have even placed a bet for 800.000! Not sure what to expect, but it will be a spectacular event without a doubt. To be able to count this many birds we need a solid team present, and the good news is that we are still looking for people to add to the current group. So, if you want to take part in migration count history, do not hesitate, and join us in writing this new chapter of the Batumi Raptor Count.